My name is Chaplin … You photographed me fifteen years ago. I want to buy some copies. Oh, we destroyed the negative long ago. Have you destroyed Mr. Leno’s negative? No, but Mr. Leno is a famous comedian. Such is fame, as Chaplin notes. The man in the picture, Dan Leno, was for anyone of Chaplin’s generation the epitome of comedy. 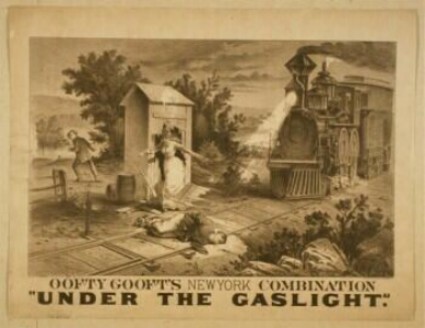 He was among the funniest and the most loved of comedians of the Victorian age, one whose career formed a bridge between the pantomime clowning of the Joe Grimaldi early-19th century era and the era of motion pictures that was to bring about the unprecedented fame of Leno’s successor as public favourite, Chaplin himself. Dan Leno’s was not one of those personalities which dominate us by awe, subjugating us against our will. His was of that other, finer kind — the lovable kind. He had, in a higher degree than any other actor I have ever seen, the indefinable quality of being sympathetic. I defy anyone not to have loved Dan Leno at first sight. The moment he capered on, with that air of wild determination, squirming in every limb with some deep grievance that must be outpoured, all hearts were his. Leno’s humour was grounded in character observation and word-play, but as with all great comedians it was a shared understanding with his audience that made him special. He pinpointed what Beerbohm identified as “the sordidness of the lower middle class, seen from within” while making that “trite and unlovely material … new and beautiful”. How we laugh at ourselves is how Dan Leno made us laugh. Dan Leno is now the subject of a new biography, the first since 1977. 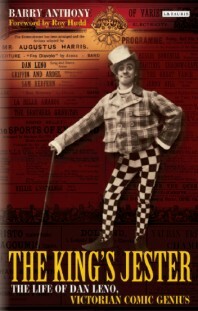 Barry Anthony’s The King’s Jester: The Life of Dan Leno, Victorian Comic Genius is published by I.B. Tauris and it is a delight from start to finish. 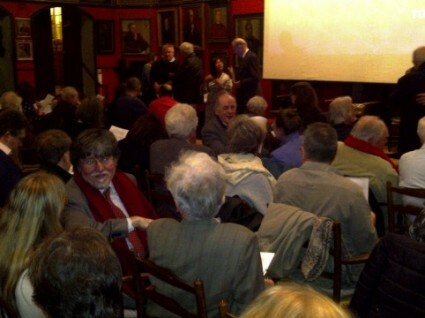 Anthony (previously co-author with Richard Brown of A Victorian Film Enterprise: The History of the British Mutoscope and Biograph Company and a fine booklet on the Kinora) is well-known among a small coterie of music hall historians for his meticulous research and encyclopaedic knowledge. He also writes beautifully. The research is worn lightly, the observations are acute, the characters stand out vividly, and the material is handled in an engaging style that makes the Victorian music hall era come alive. There is much on the Victorian music hall in general, so that the book serves as a valuable general history as well as biography. It is particularly good at giving you the essence of Leno’s performances (and those of others), as if a motion picture camera had been there. But, as Anthony points out, towards the end of Leno’s career, the motion picture cameras were there. Leno’s later career coincided with the rise of mass media as means to package and spread fame, and Leno was filmed on several occasions. Interestingly, the films that were made of Leno for the most part did not attempt to record his performances but rather focussed on his celebrity. There was a surprising number of films made of Leno – at least a dozen. But the reason why he seldom turns up in film histories is that only one of these films survives, and that in a non-film state. 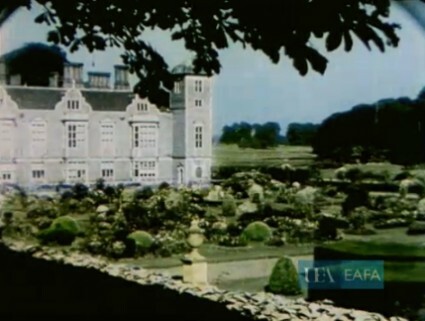 Leno was first filmed on 23 June 1899 on a trip by the music hall society the ‘Water Rats’ to Box Hill in Surrey. Impresario A.D. Thomas had them filmed on the road to Mitcham travelling in coaches (‘The Rats’ off on a Picnic), at play befor a crowd of spectators (‘The Rats’ at Play) and picnicing (‘The Rats’ at Dinner). Alongside Leno were such notables as Herbert Campbell, Joe Elvin, George Robey, Will Evans and Harry Randall. 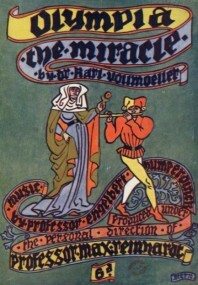 A few days later Thomas filmed the Music Hall Sports at Herne Hill in London, the sports being interspersed with comic performances intended to raise money for the Music Hall Benevolent Fund. Dan Leno featured in Burlesque Indian Attack on Settlers’ Cabin, Dan Leno’s Attempt to Master the Wheel (in the character of his famous role of Mrs Kelly) and Burlesque Fox Hunt. All titles were subsequently included in the Warwick Trading Company catalogue. Leno was filmed at other charity events. Birt Acres filmed Dan Leno’s Cricket Match in July 1900 at another mix of charity and sports, where Leno again took a turn on a bicycle. A year later, in September 1901, he was back on the cricket field (at Stamford Bridge) for Warwick’s Dan Leno’s Day Out, paired with Dan Leno, Musical Director, where he mock-conducted the Metropolitan Police Band in ‘A Little Bit Off the Top’. A few days later he appeared before the 70mm camera of the British Mutoscope and Biograph Company for Dan Leno’s Record Score, which showed him in comic argument with a wicket-keeper (for photographs from the day in Black and White Budget see the excellent Arthur Lloyd website). Anthony records that the film was exhibited alongside genuine cricket film of C.B. Fry and Ranjisinhji. 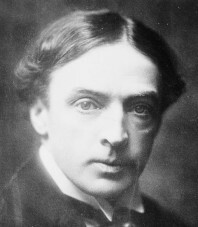 Another Biograph film was Mr Dan Leno, Assisted by Mr Herbert Campbell, Editing ‘The Sun’ (1902) in which Leno and the frequent partner in pantomime, a comic promotional film for a journal run by the notorious Horatio Bottomley. 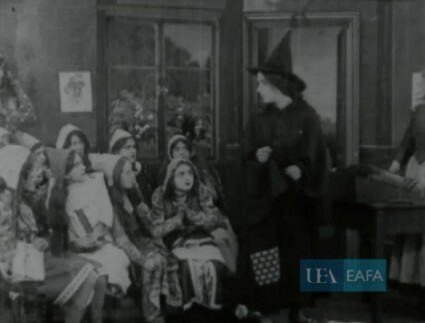 This was the only film to show an acted peformance from Leno, apart from Bluebeard (1902), an extract from a Drury Lane pantomime in which Leno played Sister Anne, produced by Warwick. 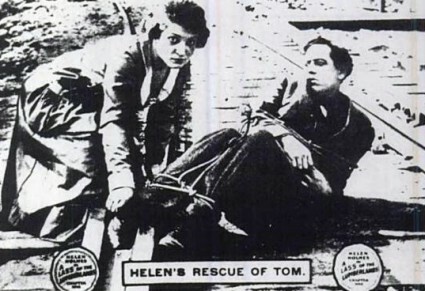 Biograph produced the only film of Leno that exists today. Its 70mm products were often issued in flip-card or flip-book form through a variety of devices for viewing at seaside arcades (through the Mutoscope) or in the home (through the Kinora). 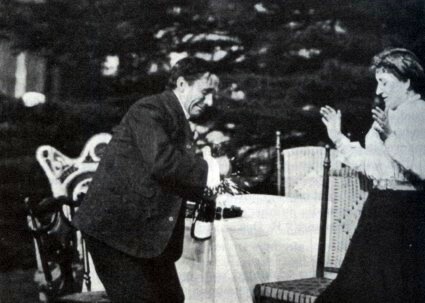 Biograph made two films in 1902 of Leno with his family in the garden at their home in Clapham, one of which showed Leno and his wife Lydia struggling to open a bottle of champagne and eventually resorting to a giant property axe to do so. The Obstinate Cork survives – in private hands – as a Kinora reel (i.e. a set of flip-cards for exhibiting in a Kinora) and forms the only moving image that exists of the great comedian. As said, most of these films did not present Leno in performance but rather Leno the celebrity, seen clowning in public, playing up to his popular persona. They crossed the barrier between fiction and non-fiction. If any were to be discovered they wouldn’t so much show us Leno’s art as his popularity, and that would be so precious in itself. Leno the comic giant belonged to his time. Nothing dates so remorsely as humour. What makes one generation roll in the aisles makes the succeeding generation shrug its shoulders or wince with embarassment. 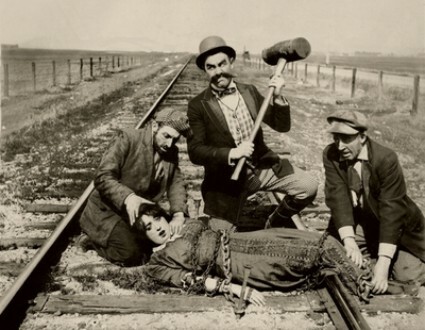 What matters for our understanding of the history of comedy is not whether we would find Grimaldi, Leno or Chaplin funny today (though we might) but that we appreciate just what they meant to the people of their time. This is what Barry Anthony’s book achieves so well. It tell us enough to give a good idea of Leno’s comedy, but still more it shows us how key he was to his times, how people identified with his humour, how much he was of his times and yet transcended his times. The films that were made of him were not intended to replicate his act but to reflect the profound affection with which he was held by millions. 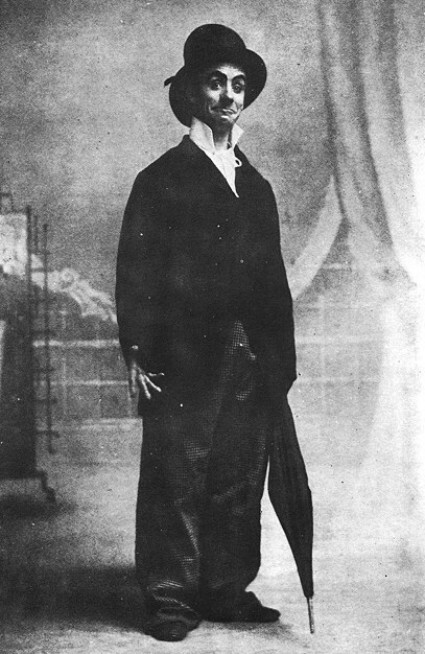 Dan Leno suffered throughout his professional life from a series of mental and physical breakdowns, brought on by the pressures of huge popularity. He died in 1904, aged just 43. Leno made a number of sound recordings, and unlike his motion picture legacy, all of these survive. 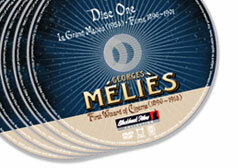 Recordings from 1901 and 1903 can be heard Music Hall Perfomers site, while his famous number ‘The Grass Widower’ can be heard on YouTube. Peter Preston has written an interesting piece in The Guardian comparing Leno’s passing fame to that which endures for Marlon Brando – as unlikely a pairing as one could imagine. Paul Morris’ essay on the English Music Hall site evocatively sums up Leno’s art. Finally, Leno’s comical pseudo-autobiography, Dan Leno Hys Booke (1899) is available online from the Internet Archive. This is an extraordinary image. It’s a Japanese postcard dating from 1908 (the postage stamp says Meijii 41, which is 1908). 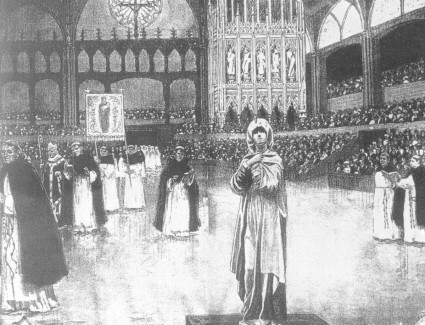 However the image that it shows dates from November 1899. It shows on the right the greatest of all kabuki actors, Ichikawa Danjuro IX (1838-1903), and on the left Onoe Kikugoro V (1844-1903), second only in fame at the time to Danjuro. They have been photographed in a scene from the dance drama Momiji-gari, translated as Viewing Scarlet Maple Leaves or Maple Leaf Hunters. And the reason the drama was performed because it was done for a motion picture camera. 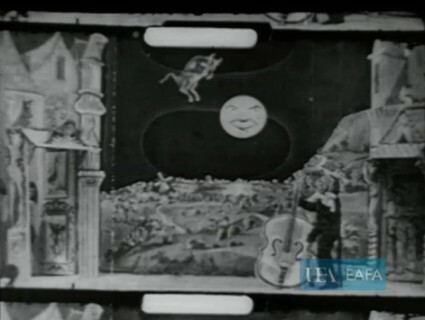 Projected film first came to Japan when businessman Inabata Katsutaro, a friend of Auguste Lumière, played host to Lumière operator François-Constant Girel, who gave a film show at the Nanchi Theatre in Osaka on 15 February 1897 (peepshow Kinetoscopes were exhibited in Japan in 1896). Film was an immediate hit with Japanese audiences, and several Japanese entrepreneurs enthusiatically adopted the new medium, among them Yokota Einosuke, Kawaura Ken’ichi and Arai Saburo. 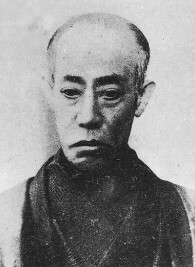 It was Arai who was the first person to approach Danjuro with a proposal to film him, in 1897. 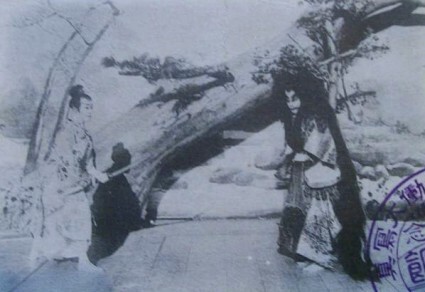 Danjuro IX (left) was a legend of the kabuki theatre, ninth in an unbroken line of actors named Danjuro, and considered one of the greatest of all Japanese actors. He did much to preserve the art of kabuki and to raise the status of actors generally. However the actor, a deeply conservative character, reacted to Arai’s proposal with repugnance, refusing to have anything with a ‘shipbrought thing’ (thus equating the cinematograph with any other kind of foreign goods). The original play, performed in both noh and kabuki, is a story of the warrior Taira no Koremochi visiting Togakushi-yama, a mountain in Shinshū for the seasonal maple-leaf viewing event. In reality, he has come to investigate and kill a demon that has been plaguing the mountain’s deity, Hachiman. There was a gusting wind that morning. We decided to do all the shooting in a small outdoor stage reserved for tea parties behind the Kabuki-za. We hurriedly set up the stage, fearing all the time that Danjuro might suddenly change his mind again. Every available hand, including Inoue, was called upon to hold the backdrop firm in the strong wind. Danjuro, playing Sarashi-the-maiden, was to dance with two fans. The wind tore one from his hands and it fluttered off to one side. Re-shooting was out of the question so the mistake stayed in the picture. Later people were to remark that this gave the piece its great charm. The first shot, in which Princess Sharashina dances with a fan, is viewed head on, as though she were center stage. 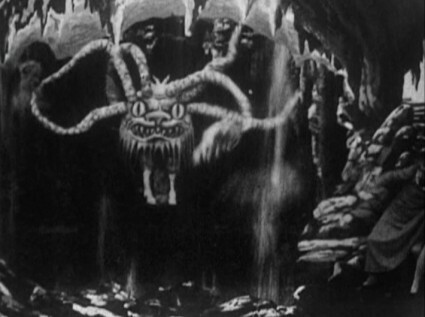 The second shot, of the “Yamagami scene”, captures Koremori (played by Kikugoro) in the foreground and Yamagami’s dance behind Koremori. The third shot is from the same camera angle as the first, and shows Koremori and the ogress’s dance. 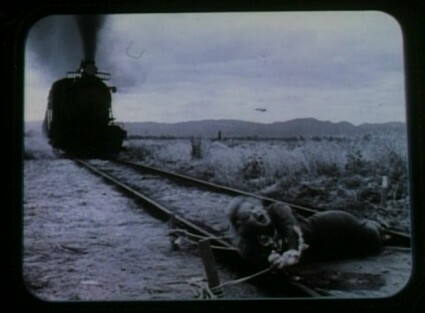 This is where the postcard comes in, which documents the film’s third scene. 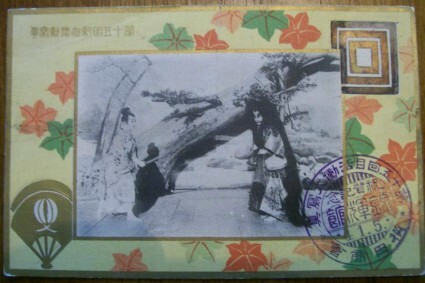 The postcard definitely shows Danjuro IX and Onoe Kikugoro V performing for the Momiji-gari film. It has been photographed in the open air, as one can see from the shadows thrown by the sunlight. Clearly Shibata not only commemorated the event in film but took a photograph (maybe more? maybe three, one for each scene?) at the same time. The postcard, however, dates from 1908, with the legend stating something along the lines that it had been produced to honour the fifth anniversary of his passing. It seems that the production was a little more planned and commercial in intent than the anecdotal histories have suggested. Certainly Danjuro was the subject of innumerable ukiyo-e prints, which suggests an awareness of the importance of image. There is an interesting parallel with what happened in Britain at almost exactly the same time. 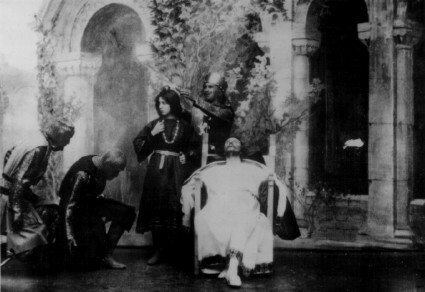 In September 1899 the renowned actor-manager Herbert Beerbohm Tree was persuaded by the British Mutoscope and Biograph Company to appear before the Biograph camera in short scenes from Shakespeare’s King John, the play he was presenting at the Her Majesty’s Theatre in London. Four scenes from the play were filmed, which did not tell the whole story but rather showed key points from the drama, just as with Momijigari. 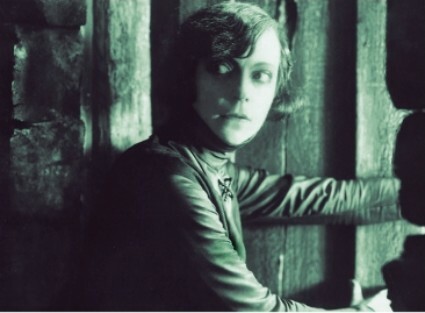 In another parallel, a set of promotional photographs were also taken at the same time. Tree was never so fastidious as Danjuro, and his intent was probably more commercial than concerned with posterity, but it is worth noting the coming together of the new medium with the old, the former gaining kudos by association with the other and showing the advantages that it had – to capture performance and defy time. It also demonstrates an idea of cinema as filmed theatre which was to influence Japanese film for several years thereafter, impeding its development as an independent art form for two decades or more. I am able to reproduce the postcard by kind permission of its owner, a US collector by name of Dan. He is looking for a buyer for the postcard, and anyone with a serious proposal should get in touch with me and I’ll pass on details to him. My thanks to him also for translations from the Japanese. The postcard is also reproduced on the Ukiyo-e Prints website, and I am grateful to its host Jerry Vegler for being so helpful, and to Stephen Herbert for having first brought the card to my attention. There are biographies of Danjuro IX on the Who’s Who of Victorian Cinema site and on Portraits of Modern Japanese Historical Figures. Much of the historical information in this post comes courtesy of Peter B. High’s article ‘The Dawn of Cinema in Japan’, Journal of Contemporary History, vol. 19 no. 1 (January 1984), with acknowledgment also to Hiroshi Komatsu’s notes for the 2001 Pordenone catalogue and his essay ‘Questions Regarding the Genesis of Nonfiction Film‘. Extensive information on kabuki – the performers, theatres, stories and characters – can be found on the Kabuki21 site. You can get an idea of how Momiji-gari would have been performed from this YouTube video (with helpful English subtitles) which shows a modern-day production (part 8 of 8, showing the finale of the drama as depicted in the postcard). Finally, it was recently suggested that the film be designated by the Japanese government as an Important Cultural Property (juyo bunkazai), the first film to be so honoured. 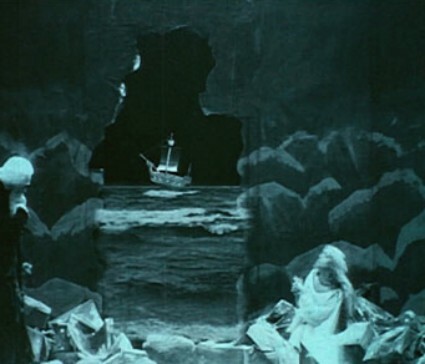 The conference organizing committee invites abstracts (200-300 words) or papers on a range of issues in film and television productions of Shakespeare from the Silents to the Age of Branagh and Baz. 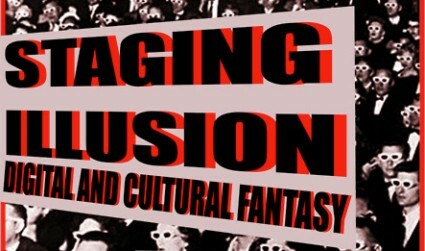 Papers can focus on individual films; the work of major directors; intertextual (and visual) dialogue between Shakespeare films or between stage and film Shakespeares; television Shakespeare; spin-off films and television programs; Shakespeare in cyberspace; global Shakespeare; theories of appropriation and adaptation; editions and screenplays; funding, promotion and marketing; photography and trailers; DVD material; audience; film scores; cinematography; cultural context; film clips; and teaching strategies. Abstracts or papers are due by June 5, 2009 (early decision) or August 28, 2009 (final deadline). All inquiries should be directed to: Samuel Crowl/Department of English/Ohio University/Athens, Ohio/45701 or via email to crowl[at]ohio.edu. All sessions of the conference except the Thursday evening keynote lecture will be held at the Ohio University Inn located just across the Hocking River from the campus of Ohio University. Special room rates will be available for conference attendees. The Friday evening conference banquet will be included in the registration fee.